Work, love and life are just one long, hard slog for the fish-filleting foursome Pearl, Jan, Shelley and Linda. But their fortunes are set to change when Linda finds tickets to Ladiesâ€™ Day at Royal Ascot the year it relocated to York. 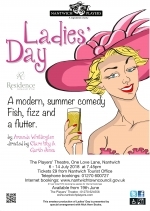 Directed by Clare Hoy and Garth Jones, performances will be at 7.45pm on 6th â€“ 14th July, 2018. Tickets priced at Â£9.00 will be on sale from Nantwich Tourist Office (01270 600727) or on-line at www.nantwichtowncouncil.gov.uk from Tuesday 19th June 2018 an 9am. Priority tickets for our VIP Supporters go on sale Saturday 16th June at the Theatre. To find out more about becoming a VIP Supporter visit the membership section of the website. Members of the Nantwich Players can audition for this production on Tuesday 3rd April from 7.45pm. Details will be available in the Newsletter and the website.